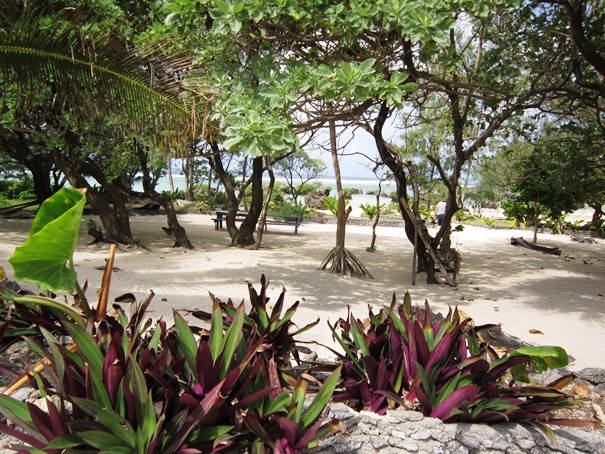 Vanuatu is a beautiful spot and very popular with Aussie and Kiwi tourists. We went on a tour of Vanuatu and went to a 'kastom', as in traditional, village where the locals supplement their income by putting on a show and selling their handicrafts to tourists. These guys danced quite well before posing for pics with us. They look fierce and might even be so. The last instance of cannibalism (on one of the more remote islands) was in 1968. 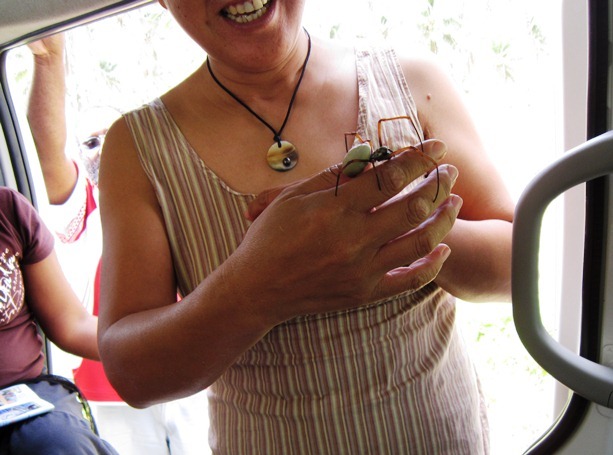 June with a 'friendly' spider as the tour guide described him. From leg to leg he was close to 8 inches long. 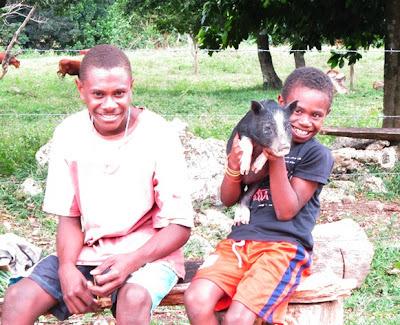 People in Vanuatu were very friendly. This youngster just wanted to show us his pig. Finally a really good tradewinds passage! We are now in Port Vila, Vanuatu after coming 580 miles from Suva, Fiji. This passage is more of what we expected. We had runs of 130, 138, 148, and 160 n.m. (just think how fast we would have gone if it was a 10 day passage) with just the poled-out genoa up and the wind behind us. About halfway through the trip we gybed from port to starboard and that was it. We also had only one rain shower, although June was lying on the cockpit seat one day when a perfectly-aimed wave slapped against the hull and dropped a gallon or so of water exactly on her body and nowhere else. Vanuatu is a very interesting spot for a stop and it is unfortunate that we do not have more time here to explore. We knew virtually nothing about the country before arrival except some of the dated stuff in the Landfalls of Paradise cruising guide. It is a string of islands spread from north (13°S) to south (21°S) that used to be known as the New Hebrides in colonial times. These islands have a unique colonial history. For 80 years, until 1970 when they became independent, they had a ‘condominium’ (that was the official term) French-English government. This meant that there were parallel government systems operating at the same time in the same place, e.g. two police forces, two school systems, etc. It seemed to work OK and the result today is a country in which there are two cultures and three widely-used languages. These are Melanesian, rather than Polynesian, islands and the Melanesians were not seafarers as were their neighbours to the east. The result was that Vanuatu had 115 languages (and a whole whack of anthropologists) plus French and English. The government worked to create a formalized version of pidgin English, called Bislama, which most people speak, although you also hear a lot of English and French in Port Vila, which is the capital and largest city. You see many signs in Bislama (although English is most common) and you can just about understand it. For example, ‘beer’ is ‘bia’ ‘how are you?’ is ‘yu oraet’, and and ‘excuse me’ is ‘skiusmi’. It is all pretty neat since I thought that pidgin English was a relic of the past and something found in the writings of Jack London. And now for your Bislama quiz. Most of the buses and taxis (they look the same) have a sign on them that says, ‘Plis siam doah slo’. What does this tell you? The answer is at the end of this post. It turns out that Vanuatu has experienced 26 earthquakes (according to the US Geological Survey) in the past week. We have felt nothing because they occurred at night but people in the city went into the streets. Magnitudes of these quakes is from 5.0 to 7.1. That means that we have had a volcanic eruption, a tsunami, and a swarm of earthquakes on this trip - cool, but we can do without the plague of locusts. Vanuatu is probably the poorest country we have visited but that does not mean it is cheap to be here. There are two parallel economies here with 80% of the people living in rural areas in something close to a traditional, subsistence agriculture way, while at the same time there is an urban economy linked to the tourist trade (lots of Aussies here). We had lunch in a lovely restaurant that was quite sophisticated and would be a hit in Toronto or any other major city. Right next door is the market, in a building constructed with French foreign aid that was quite good but had major sections selling firewood and charcoal. Apparently most people use these fuels rather than kerosene or gas. June found the shopping here to be quite good with a direct pipeline to the Chinese knockoff industry. For example, you could buy DVDs of all of the movies we saw in Fiji (new Planet of the Apes, Crazy, Stupid Love, and Captain America) that were released within the last month. ‘Plis siam doah slo’ translates to ‘Please slam the door slowly’. All over the world, the sliding doors on 15 passenger Toyota (and other) minivans seem to be a particular weak spot. I got a lecture in Lesotho once for closing the door there with too much vigour. Posted by Bruce at 5:32 a.m.